South Sudan Information Minister Michael Makuei said Saturday that reports the government was pulling out of peace talks in Addis Ababa were "irresponsible" and "a lie." "It is unfortunate that some of the groups have been spreading a lie that the government of South Sudan has decided to withdraw its delegation from Addis," Makuei said at a news conference in Addis Ababa. "We came here to deny and inform you and denounce that irresponsible statement and to confirm to you that the government delegation is available in Addis and it will continue with the negotiations up to the end," Makuei said. "We came here to negotiate peace. We did not come here for any other reason other than peace," he said. 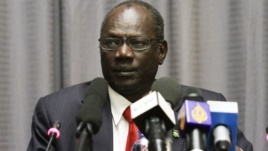 It was South Sudan's Cabinet Affairs minister, Martin Elia Lomoro, who told reporters in Juba on Friday that the government decided to recall the entire negotiating team from Addis. Lomoro also said President Salva Kiir would not be attending the peace talks in Addis until it was clear who his main interlocutor would be. ​Within hours of Lomoro making his statement, the government's lead negotiator at the talks flatly denied that he and his team had been ordered back to Juba. "Absolutely not, we have not been recalled," Nhial Deng Nhial told South Sudan in Focus by phone from the Ethiopian capital. "I am still here with the entire team in Addis Ababa." Deng said the two sides were still “working towards the objective” of signing a peace deal by Monday's deadline, which was set by the international mediation team, known as IGAD-Plus. He also said Kiir did not show up at the talks because he didn't receive his invitation until Friday. At a separate news conference, the lead mediator at the talks, Ethiopian veteran diplomat Seyoum Mesfin, said IGAD-Plus had still not received official confirmation that Kiir would not be attending the talks. He said the agenda for the talks was sent to both sides weeks ago, and what Kiir received Friday was merely a reminder. Seyoum said the Ethiopian Foreign Ministry has told the mediation team that South Sudanese Vice President James Wani Igga will represent the government at a summit meeting of IGAD-Plus on Sunday. Other leaders at the talks are trying to convince Kiir to attend, Seyoum said. No one is forcing these people to sign a document. What the mediation is saying is we have heard them for the last almost 20 months. They are repeating the same thing. They are circling the wagon. ​"The leader of the opposition is here, so President Salva is expected to lead the delegation, negotiate with his compatriots, with his adversaries in the country," Seyoum said. Seyoum said the two negotiating teams are still "working together to reach agreement." Any changes to the compromise deal drafted by IGAD-Plus that are agreed to mutually by the government and rebel negotiators will be accepted by the mediators, Seyoum said. Any articles that the two negotiating teams fail to agree on will remain as they are, he said. The Ethiopian diplomat rejected statements made by Makuei that the mediators were "imposing their sentiment" on the warring South Sudanese sides and using language "unbecoming of a mediator" by telling the negotiating teams they would not be allowed to leave Addis Ababa unless they signed the compromise peace deal by the deadline. "No one is forcing these people to sign a document. What the mediation is saying is we have heard them for the last almost 20 months. They are repeating the same thing. They are circling the wagon," Seyoum said. "There are no new issues that they are talking about: It is power-sharing, it is security arrangements, it is the structure of the government," he said. "If they are really serious and committed as leaders, they are expected to take courageous decisions, difficult decisions, because that is what is required of them to end this crisis and the killing," he said. At least 10,000 people have been killed in the conflict in South Sudan and more than 2 million have fled their homes since fighting erupted in December 2013. IGAD-mediated peace talks have been underway since January last year, and have resulted in several agreements to end the violence — all of which have been violated within hours of being signed. Seyoum said earlier this week that the Monday deadline to sign a peace deal will not be extended.